The creator of Dolly the Sheep heads a list of Scots honoured by the Queen. Professor Ian Wilmut is to receive a knighthood for his pioneering work at the Roslin Institute near Edinburgh - including cloning the first mammal. 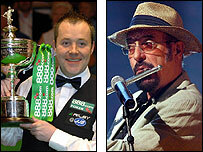 World snooker champion John Higgins is made an MBE for services to the game, as is Ian Anderson, frontman of veteran rock band Jethro Tull. The housebuilding tycoon Stewart Milne, the majority shareholder of Aberdeen Football Club, becomes a CBE. Professor Wilmut said: "I am naturally delighted and excited by this award and accept it on behalf of the team in the new Centre for Regenerative Medicine at the University of Edinburgh, and previously at the Roslin Institute. "It also recognises the importance of biomedical research to develop new treatments in regenerative medicine which holds great hope for the future." Glasgow-born film producer Iain Smith, renowned for his production of Hollywood blockbusters such as The Fifth Element, becomes an OBE. Other Scots being honoured include Central Scotland Police chief constable Andrew Cameron, Glasgow School of Art director Seona Reid, tourism chief Philip Riddle and acclaimed artist Alison Watt. Former drama lecturer Annie Inglis, who has been heavily involved in amateur dramatics in the north east of Scotland for 50 years, has been made an MBE. The list of Scotland's knighthoods includes Ian Good, head of the Edrington drinks group and chairman of the Scotch Whisky Association. The Edrington group, whose brands include The Macallan and Famous Grouse, is said to be one of Scotland's biggest private manufacturing companies and exports five million cases a year. Knighthoods are also conferred on Professor Timothy O'Shea and Professor John Savill, both of Edinburgh University, for services to higher education and clinical science respectively. The best-known of the new knights is Professor Wilmut, who is said to have revolutionised biology by successfully pioneering the cloning technique that underpins the science of stem cell technology. His role in cloning Dolly the sheep, the world's first clone from an adult cell, led to an OBE in 1999 and he has been elected to five scientific academies worldwide. 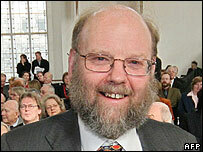 He now heads the Scottish Centre for Regenerative Medicine at Edinburgh University.